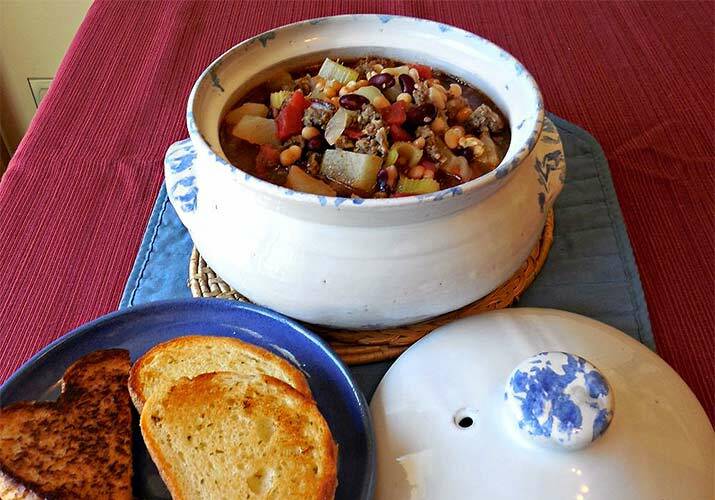 This Sausage Bean Soup recipe is perfect for those cold days–it’s a hearty winter soup. I love most any kind of soup, and this one will definitely hit the spot. Just add some cornbread or a grilled cheese sandwich for a meal. This soup will keep for several days in the refrigerator and freezes well. It’s a satisfying dish your family will love! Brown sausage, onion, green pepper and celery in a skillet. Drain. Combine browned ingredients with all other ingredients in a large pot on top of the stove. Simmer for about one hour, or until potatoes are done. This makes approximately 10 cups of soup. Enjoy! This could easily be done in a crock pot, too. Just add your cooked sausage mixture to the crock pot, along with other ingredients, and cook on high for about 4 hours or on low for around 6 hours. This zesty chicken casserole recipe makes plenty! My family loves it. You will need a large skillet. Cook the green pepper and onion in the oil. Add the tomatoes, celery soup, chicken soup, green chilis, chili powder, garlic powder, pepper, salt and cumin to the skillet. Mix well with a spoon and simmer about 10 minutes. 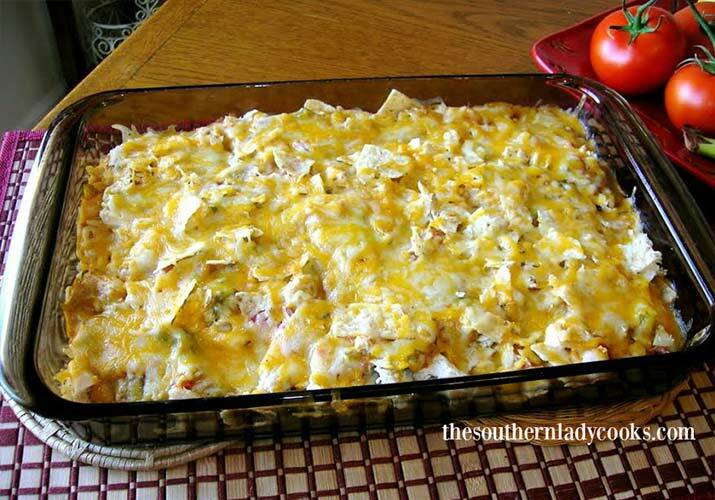 Add a layer of crushed tortilla chips to a 9” x 13” baking dish. Next, add a layer of chicken and cover with half the soup mixture from your skillet. Sprinkle on 1 cup of the shredded cheese. Add another layer of chips, chicken, and the rest of the soup mixtures. Bake in a preheated 350 degree oven for 20 to 25 minutes. Remove and add remaining cup of cheese. Return to oven for about 5 minutes or long enough to melt the cheese on top of the casserole dish. Makes 10 to 12 servings. Enjoy! You can add some cayenne or hot sauce to this casserole if you like spicy food. You can serve with a dollop of sour cream on top, chopped tomatoes, olives, etc. You can use your imagination and add other ingredients, too. This makes a great dish for potlucks! Julie Yeager of The Southern Lady Cooks had no idea when she started her food blog in 2008, she would have such an amazing following... 800k and growing on Facebook! She loves to feature many traditional Southern recipes, along with family recipes and dishes created in her Kentucky Kitchen.